"He specializes in behavioral disorders." 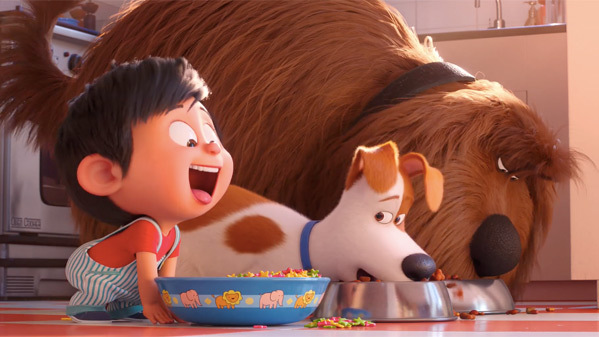 Universal + Illumination have finally revealed a full-length trailer for Chris Renaud's The Secret Life of Pets 2, the sequel to the animated hit from a few years ago about pets and the life they have after their owners leave. This trailer comes after a total of six different teaser trailers focusing on individual characters from the film. Each of the pets from the original are now dealing with different life changes. Can Max, Snowball, Gidget and the rest of the gang find the inner courage to face their biggest fears? The full voice cast includes Patton Oswalt, Eric Stonestreet, Ellie Kemper, Lake Bell, Jenny Slate, Dana Carvey, Albert Brooks, Hannibal Buress, Bobby Moynihan, Kylie Hart, Nick Kroll, Pete Holmes, and Harrison Ford as Rooster. This looks like it has all the cuteness and the charm and the fun of the first, with even more characters (and pets) to follow on their adventures. Have fun. You can watch the first teaser for Secret Life of Pets 2 here + teasers for Chloe, Snowball, Gidget, Rooster.